At a meeting of the council last week, the authority’s executive member for roads and infrastructure, Councillor Gordon Edgar, fielded questions from concerned opposition councillors. Mr Edgar pointed out that the local authority performs very well against its contamination targets: “The quantity of contaminated material collected, in terms of the council’s kerbside recycling service, has remained fairly static in recent years at around 12%. “In the last 24 months, the council has only once exceeded the target contamination level outlined in its recycling contract. “Contamination is an important factor, and officers are currently developing a communications campaign to increase awareness, reduce contamination and increase recycling rates. A Scottish Borders Council spokesperson said: “In 2017 the Scottish Environment Protection Agency indicated that the average contamination of material accepted at material recover facilities is around 17% but in some cases is as high as 43%. 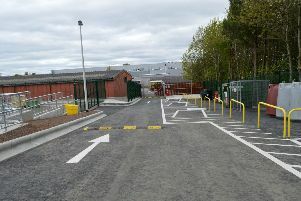 “Over the last four years the council has taken a number of steps towards improving its recycling performance, including the introduction of a footways collection service, upgrades to community recycling centres, as well as introducing reuse schemes at a number of facilities, and working with local community groups and the third sector. “Going forward, the council is in the process of developing a new waste transfer station, which will enable the council to close its landfill site, and divert waste for treatment, while also capturing potentially recyclable waste. “In addition, the council is also looking at an education and awareness campaign. The average rate of recycling household waste for Scottish authorities is 46%, but East Renfrewshire, West Lothian and Clackmannanshire have all hit the 60% mark.